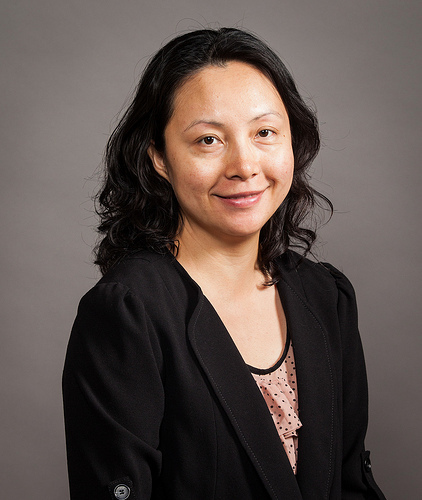 Ning “Jenny” Jiang, Ph.D., CPRIT Scholar and Assistant Professor of Biomedical Engineering at UT Austin, leads a team of graduate research assistants at the University’s Jiang Lab on Systems Immunology. This past year, Professor Jiang was one of six individuals to receive the prestigious Damon Runyon-Rachleff Innovation Award for her ground-breaking approach to fighting cancer. Her research explores new opportunities for cancer immunotherapy and early diagnosis of breast cancer; she believes we’re ready to understand how our own immune system can help us fight cancer. Q&A with Ning “Jenny” Jiang, Ph.D.
1. What is different about your approach to cancer research? How does the immune system develop and age? What are the molecular signatures of autoimmune diseases? Why does the immune system tolerate tumors? My research is attempting to establish a new set of “metrics” for cancer progression prediction, immune monitoring, and to provide new biomarkers for development of new therapies. 2. Does cancer grow because something in the immune system gets “turned off”? Yes. Cancer can suppress all components of the immune system either by making the immune system ignore cancer cells or by making it unable to kill them. 3. Do researchers have a basic understanding of how this happens yet? We have some understanding of how this happens and that is the reason we have several FDA approved cancer immunotherapies (such as the HPV vaccine used to fight cervical cancer). However, we still lack a complete understanding of the interplay between cancer and the immune system. 4. Is it possible that the immune system can also promote tumor growth? It may sound ironic, but yes, it is possible for the immune system to promote tumor growth. There are specialized suppressor cells in the immune system that dampen immune responses. Tumors often take advantage of these suppressor cells to benefit their own growth and hide from the tumor-killing immune cells. 5. Can you explain (in simple terms) the theory of “cancer immunoediting”? Cancer immunoediting theory describes the interaction between cancer and the immune system. This interaction unfolds in three sequential phases: elimination, equilibrium, and escape. During the elimination phase, immune cells, specifically T cells, protect the body from tumors by recognizing tumor antigens* and “eliminating” them before they can cause harm. Tumor cells that are not eliminated, enter the next phase called equilibrium. This is the longest of the three phases and may occur over a period of many years. During equilibrium, new tumor cells emerge with a variety of mutations that make them resistant to attack by the immune system. Some mutations can suppress the immune system’s ability to kill the cancer cells while other mutations allow the cancer cells to disguise themselves. In either case, the mutated cancer cells enter the final phase called escape. During this phase, the cancer cells “escape” recognition by the immune system and survive. As a result, the cancer either progresses (becomes a more advanced stage of cancer) or metastasizes (spreads to other parts of the body). 6. Do you think it’s possible that the immune system can be used to fight tumors after they have already formed? Yes. I think so. There are already a few cancer immunotherapy drugs that have been approved by FDA for melanoma, such as Ipilimumab (for CTLA-4 blockade) and Pembrolizumab (for PD-1 blockade). These therapies indicate it is possible to use the immune system to fight tumors after they have already formed. The challenge is understanding in detail how the molecular and cellular mechanisms of protection work. 7. Do you think your research could lead to vaccines to prevent initial tumor formation or the spread of cancer to other parts of the body? Vaccines for some viral infection induced cancers are already in use, such as vaccines against the Hepatitis B virus for liver cancer and the Human Papilloma Virus (HPV) for cervical cancer. However, to design vaccines for other types of cancer requires an in-depth knowledge of tumor antigens. This is challenging because most tumor antigens* are also expressed in normal cells. We also can’t look for mutated tumor antigens – those restricted to tumor cells – because no one has been able to identify a common mutation for any particular cancer. I am hopeful that studying cancer mutations, tumor antigen expression levels, and the sensitivity of T cells** could lead to preventive cancer vaccines in the future. 8. There have been clinical trials using T-cell therapy for metastatic melanoma. Do you think your research might lead to similar clinical trials for breast cancer? Therapies from many of the metastatic melanoma trials have been approved by the FDA. However, studies have shown that applying a treatment designed for melanoma directly to breast cancer is not effective. My collaborators at MD Anderson Cancer Center and I have an idea we’d like to study, but getting funding to conduct a study has not been easy. 9. Is it difficult to get funding for this type of research? Yes, potential funders require a lot of preliminary data in order to consider funding your research. Unfortunately, considering the work involves the immune system in humans rather than those of laboratory mice, obtaining this data requires extensive resources. I am grateful that CPRIT recognized the potential of my research before I had any preliminary data in humans. The Damon Runyon Cancer Foundation has also been very supportive of the innovative research I am doing. They recognize that while it could be high-risk, it can also be high-reward. * Tumor antigen is a substance produced in tumor cells which causes the immune system to produce antibodies against it. Tumor antigens are useful markers that help detect the presence of cancer. ** T cells are a type of immune cells that protect the body from tumors by recognizing tumor specific antigens and “eliminating” them before they can cause harm. With adequate funding, immunology research like Dr. Jiang’s could turn the hope for a breast cancer vaccine into a concrete reality. In 2010, the National Breast Cancer Coalition launched the Breast Cancer Deadline 2020®, to focus resources on obtaining the knowledge needed to end breast cancer. The research component of the Breast Cancer Deadline 2020® includes the Artemis Project®, which is dedicated to advancing and funding basic scientific research aimed at preventing breast cancer from spreading to other parts of the body and becoming deadly. For more information about the Artemis project, please visit the Breast Cancer Deadline 2020 website.